Yesterday I went shopping at Target. This is what I got. A set of 12 Platinum Banded Glass Goblets. 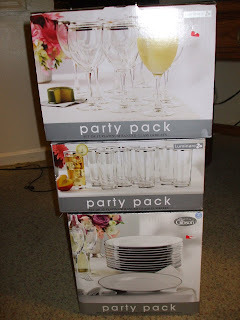 It is a perfect extra glasses for parties and holiday gatherings. A set of 12 Platinum Banded Glass Tumblers and a set of 12 Platinum Banded Porcelain Dinner Plates. More stuff to fill in my Balikbayan box to send home. I also bought some clothes for myself-:) Hmm.. I throw them in the washer already! lovely girl, I need a set too...musta nah?